This looks to be a basic plastic baby doll with a pikinsh plastic body. The head is a paler shade of pink with a rubbery texture. Her eyes are painted on and do not blink. There is a makers mark on the back of her neck that says "Made in Hong Kong". Her hair is short; very glossy and curly and sits very tightly against her head under her bonnet. She has a makers mark printed on her back between her shoulders that says, "Made in Hong Kong". Her clothing is a hand-made outfit, knitted or crocheted, that was created using yellow and white yarn. She has a dress with a knitted sash that ties in a bow around the front of her body, She has a bonnet that also ties securely under her chin, and she also has a pair of yellow booties that each have a decorative bow on the top. She is approximately 10.5 inches long, 5.5 inches from hand to hand, and about 5 inches thick. The skirt spreads out to about 12 inches wide. She weighs 7.4 ounces. This little doll is well over 30 years old, and in good condition. She has never been played with. 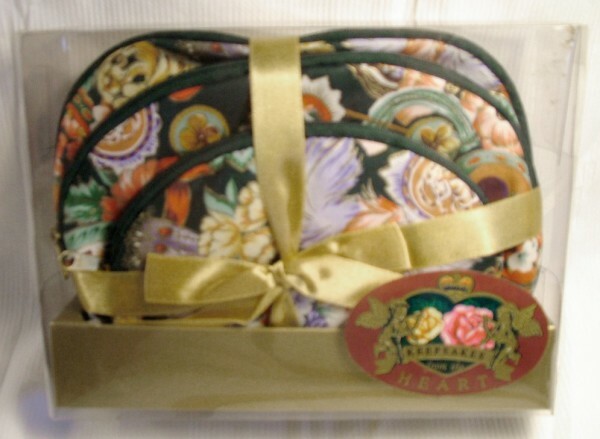 These three purse pouches are still in their original package and wrapped together with a glittering yellow ribbon. They are in a square plastic package which has a sticker on the front that says "Keepsakes from the Heart". Each pouch is a different size and zippers closed across the top. The package they are in measures 8x6x2 inches, and weighs 5.9 ounces. These pouches are at least 30 years old, and in good condition. They have never been used.